1. In a small pot, bring two cups of water to a boil. 2. Rinse tapioca pearls, drain, and add to the boiling water. 5. Turn off heat, and mix in the vanilla extract. Pour some pudding into a small bowl and be amazed by how delicious it is. The pudding will still be fairly gooey at this point, but it will thicken significantly as it cools. Coconut milk, here we go! If you don’t eat it all instantly, refrigerate what’s left and the pudding will gel up and thicken! This was all that was left of the pudding to take a picture of the next morning! It turned super thick and gooey. Nom nom. 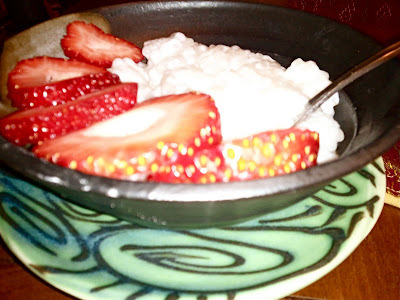 A word of warning – light coconut milk is extremely silly (and possibly evil). It’s coconut milk diluted with water… in a can. For the same price (or more!) as regular coconut milk. And significantly less delicious. 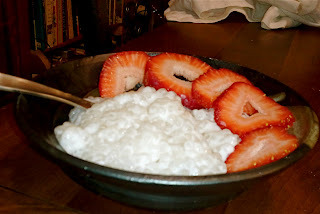 The quest for more delicious pudding was too great to be deterred by lite coconut milk, however, and so, out of necessity, this healthier version of coconut tapioca pudding was born! It’s much less decadent than the original version, but still delicious. It’s less coconut-y, so tastes similar to traditional tapioca pudding. Which is tasty too! The directions are the same as the original version. The soymilk goes in with the coconut milk (I just refilled the can with soymilk and added it). Aw...Ariel! I actually found the tapioca pearls in a box with some kitchen supplies when I was unpacking a couple days ago! XD Ohh I have bananas, but I'm missing coconut milk. Looks like I'm going to have to go shopping soon. Hope you're doing well! i made the full-fat version. so good! so good!! Fat is good for us, it's the kind of fat-this is one of those good fats. mixed stewed rhubarb through and it was delicious. Just made this, it's cooling outside on my deck as it's beginning to snow. It smells incredibly good....I had one full fat can of coconut milk and one lite...so I made a double batch and added about 1/2 cup of sweetened shredded coconut. I made a batch of the light coconut kind, and it was good, but not WOW good. I'm going to try the full fat version tonight. I'm wondering, do you have to soak the pearls for two hours before cooking it like the box and so many other recipes call for? I'm going to try it out. Yesterday I had to wait two hours before making my pudding and by the time it was done it was really late. I left a bunch in the fridge overnight with almond milk, so my pearls are ready and waiting for my next full fatty goodness batch. Thanks for a great recipe, I can't wait to eat it!